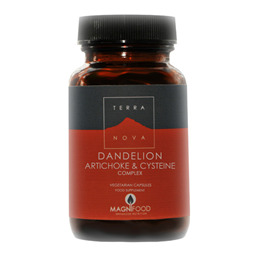 TERRANOVA Dandelion Artichoke & Cysteine Complex is a scientifically-based formulation of nutrients for joint support enhanced with highly active, whole and unadulterated superfoods and botanicals. Dandelion root is may help maintain healthy liver function primarily due to the encouragement of bile flow, (which may discourage the accumulation of certain toxins in the liver). The curcuminoids in turmeric root have been heavily researched for their powerful antioxidant properties, which is especially significant considering the destructive effect of free radicals on liver health. More specifically, turmeric may enhance the activity of two enzymes crucial to liver health. In addition to helping maintain healthy bile flow, artichoke leaf may protect against free radical damage to the liver and may support proper liver cell regeneration. Schisandra may play a beneficial role in promotion of detoxing. In addition, the berries have considerable antioxidant protection. Kale has major sulphur-rich antioxidants, such as sulforaphane and indole-3-carbinol. Below are reviews of TERRANOVA Dandelion Artichoke & Cysteine - 100 Vegicaps by bodykind customers. If you have tried this product we'd love to hear what you think so please leave a review. TERRANOVA Dandelion Artichoke & Cysteine Complex is a scientifically-based formulation of nutrients for liver support enhanced with highly active, whole and unadulterated superfoods and botanicals.